Free ZIP Code Database - U.S.
What is a ZIP Code Database? Our ZIP Code Database is set of all U.S. ZIP code data put into row and column format for easy use and manipulation. The free version comes with 7 data fields for every ZIP code in the United States. It has all the basic information you need to validate ZIP Code entry and basic mapping. The Free ZIP Code database is for personal use only and may not be used commercially or redistributed in any manner. ** The Latitude and Longitude provided to an accuracy of 4 decimal places. This is acceptable for most uses. Our professional databases offer Latitude/Longitude precision to 6 decimal places. You must create an account to access the monthly database. Download all file formats (Access, Excel, CSV, and SQL). An email will be sent to the address entered confirmation before you can download. All subscriptions are not automatically renewed. Learn more about our Professional ZIP Code Databases. ZipCode Char(5) 00000-99999 Five digit numeric ZIP Code of the area. State Char(2) 2 letter state name abbreviation. City VarChar(35) Name of the city as designated by the USPS. Latitude Decimal(12, 4) Geographic coordinate as a point measured in degrees north or south of the equator. Longitude Decimal(12, 4) Geographic coordinate as a point measured in degrees east or west of the Greenwich Meridian. ClassificationCode Char(1) The classification type of this ZIP Code. Population Integer The population of the ZIP Code based on 2010 Census data. Why do some ZIP codes only have 3 or 4 digits in Excel? How can I use the Free ZIP Code Database? A. Our US ZIP Code Database is provided in three (3) formats: Microsoft® Access [MDB], Microsoft® Excel [XLS], and ASCII Comma Delimited [CSV]. A. No, our US ZIP Code Database is not mailed to you on CD. Once your order is completed, you will be able to download immediately. All monthly updates are also provided for online download. This ensures fastest delivery as the database is updated each month. Q. Why do some ZIP codes only have 3 or 4 digits in Excel? A. Several ZIP Codes start 0 or 00. Excel interprets the column as numeric data, therefore it removes all preceding zeros. The data is good, it is simply Excel formatting the output. To correct this, open the spreadsheet. Highlight the column by clicking on "A" above the ZIP Code Label. From the menu at the top of the application, choose "Format" and then "Cells". On the popup window, choose "Special" from the "Number Tab" section, and then choose "ZIP Code" to the right. Click "OK". The ZIP Codes should now be formatted properly. A. Our ZIP Code Database is licensed and compiled from various sources. Postal and Delivery data comes from the USPS, Demographic data from the US Census, Statistical Areas from the OMB (Office of Management & Budget), private data sources, and some are computed by Zip-Codes.com. A. Accurate data is critical to the success of your business and ours. Zip-Codes.com implements a very rigorous set of data integrity checks to ensure our database is as accurate as possible. In the unlikely event that a portion of data is confirmed as inaccurate, we will correct it within 2 business days. Q. Do you sport Military APO/FPO/DPO ZIP Codes?? Q. How can I use the Free ZIP Code Database? A. The Free ZIP Code database is for personal use only and may not be used commercially or redistributed in any manner. NEW! 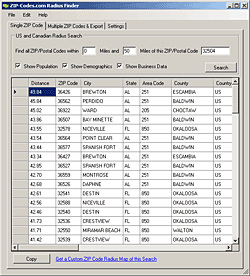 The Zip-Codes.com Business ZIP Code Database now comes with Multi-County Data. ZIP Codes are assigned by the US Postal Service and as such, do not follow State, County, or even City boundaries. Many ZIP Codes even cross county borders (about 25%). With the Business Database, you can now know every county a ZIP Code covers. Zip-Codes.com offers our customers several free applications, tools, and sample code. We hope these tools make your life a little easier with regards to manipulating our databases.